Welcome to the UK Swift Science Data Centre. The NASA-led Swift satellite discovers Gamma-Ray Bursts (GRBs) and measures their X-ray and optical afterglows to arc-second accuracy within a minute or two, continuing to make spectral observations until they fade from view days, weeks or even months later. 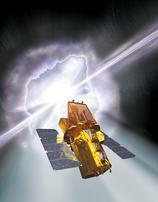 Swift has been finding around 90 new bursts a year since launch in November 2004. It has provided the most complete study of GRBs so far, finding the most distant objects in the Universe and rapidly advancing science in this area. Swift is a rapid-response multi-wavelength facility which is ideal for observations of transient and variable sources; it has a Guest Investigator programme and a flexible Target of Opportunity programme which is well used. On this site you can find out more about the mission and GRBs, as well as obtaining data from the on-board instruments and building X-ray products. One of our team is tweeting about life as a Swift scientist - follow him on Twitter!